The map below reflects our travel route around the world with links to the blog posts and photos for each city or country we visited. 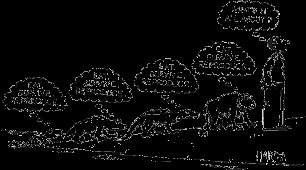 This brings us full circle to some of our earliest blog posts on planning the trip and our itinerary. We've been asked by friends and strangers alike whether this trip was a life changing experience. It has definitely changed our perspectives in many ways, small and large, and helped us better appreciate what we have. So we thought we would share a few of the reflections and lessons we would like to keep with us. See the world through the eyes of a three-year-old. A three-year-old lives in a completely different world, where everything is mysterious and exciting no matter what it is, even the mundane surroundings that we seldom notice going about our daily lives. Traveling, exploring new places and meeting new people helped us remember how to see the world in the same way – wide-eyed, curious and with a fresh perspective. From the start of our travels, we felt alive and engaged everyday, more than we had in some time. It should be this way all the time, even when walking the same path to work everyday, because life is too short and too precious to spend any time sleeping through it. Many people have said to us along the way: “Wow, I wish I could travel like you guys.” Our response has always been the same: “You can.” Whatever the constraints (house, job, kids, etc. ), they always appear more daunting than they actually are. Before we decided to take off, we were nervous about leaving our jobs and traveling for such a long time without any income or plans for when we returned...what about our careers, what if we couldn’t get good jobs when we came back? But as soon as we actually made the decision, all of a sudden it seemed so obvious that we had to do this, and the fears started to evaporate. Life is short, and uncertain. Whatever it is you want to do in your life, whether it’s moving to a foreign country or starting a new business or taking a painting class, don’t wait. For us, it was traveling together early in our marriage. It’s opened new possibilities about what we’d like to do next and how we’d like to spend our time. Most importantly, you never know what could happen tomorrow so don't waste today! Life is simple if you let it be. 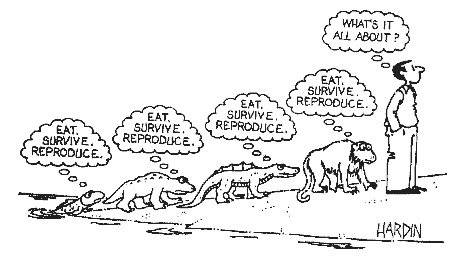 We saw a work of art based on this cartoon at a Beijing gallery and thought it was a great reminder that we often overthink life, but it can be simple if we let it be. We received a lot of great advice and input from people we met on our travels but one comment that stuck with us came from an elderly man we met in Sydney on our Harbour Bridge Climb. He told us that taking this time to travel is the best investment we could make in ourselves. So sometimes when we feel stressed about the money we've spent or figuring out the next career move, it helps us remember that the time we have spent together, people we have built relationships with, cultures we have gotten glimpses into, and places we have seen are priceless experiences we will remember forever. I like long flights. It’s a great chance to catch up on movies and books with limited distractions (no Internet and no bad reality TV). I watched Crash, The Hurt Locker, and I love You, Man on the 13h40m flight from Sydney to LAX. (Two years ago on a flight from NYC to Seoul I actually watched four feature-length films, procrastinating instead of working on a speech I had to write.) The thing is if I wanted I could spend every evening (or at least a few nights a week) watching movies and reading books but I don’t. Jay and I talked about this when we were in India. I’m not sure whether it’s because it wouldn’t be as much fun if I were to watch movies that often or because the time never feels as much my own when I’m at home. It’s probably a bit of both but mostly the latter. I get way too sidetracked by email, internet, phone, and bad TV. Have to work on changing this when I return. Well, at least this is how we did it. It was the ultimate road trip – whale-watching, glacier walking, skydiving, and more than 2,000km of driving in six days. And if you like curvy, empty, single-lane highways with high speed limits and no cops, surrounded by mountains on one side and ocean on the other (who doesn’t? ), the South Island is a fun place to drive. Skydive Photographer. Not a skydive jumpmaster. Not just a photographer. But the guy who hangs on to the wing of the aircraft to get the perfect snapshot as you jump, and then performs crazy acrobats to catch up with you so that he can take a video of you tumbling through the air. Now I know that if I can’t get a job when I go back to the States, I can always get skydive certified and drift from one exotic location to another and get paid to photograph people jumping from airplanes. Queenstown, declared “fit for a queen” given its Lord of the Rings cinematic scenery, is the adrenaline rush capital of the world (bungy jumping, jetboating, white-water rafting, canyoning, hang gliding...you pick your poison). I thought skydiving would be an appropriate exclamation point to mark the end of our trip. I had always wanted to experience flight so what better time than now and what better place than here. Queenstown has the highest skydiving in the world at 16,500ft above sea level (15,000ft above ground) – 60 seconds of free fall at a terminal velocity of 200kph followed by five minutes parachuting at a more leisurely 30kph. The feeling of jumping from an aircraft at 15,000ft and plummeting towards the ground at 200kph is indescribable. I was definitely nervous as the plane ascended but it wasn’t nearly as scary as I thought it would be. And once we left the plane it was exhilarating beyond anything I’ve experienced before. After my tandem “Jumpmaster” Nick deployed the parachute, I took a deep breath, looked around at the mountains and lakes below, and smiled, “So this is what it feels like to fly...” Nick replied, “Yeah bro.” I enjoyed the rest of my flight with my arms extended and a big grin on my face. The photos are brilliant, but the video is ridiculous. We'll try to upload once we're back in the States in a few days. How often do you get the chance to walk on a glacier? We spent our next day hiking up Franz Josef Glacier, one of the steepest and fastest flowing glaciers in the world, moving up to 10x faster than most valley glaciers. The glacier gets almost 30m of snow every year pushing the ice down the valley, sliding on a layer of water under the glacier, like a “river of ice.” More info on how this works here. Franz Josef Glacier is also unique in how low it extends (270m above sea level) through a dramatic glacial valley all the way to the temperate rain forest, a pretty cool visual. We were on the glacier for about six hours and were lucky to climb higher than any groups have climbed in the past five years – it was the last day of work for two of the senior guides so they wanted a special climb for their last hike! 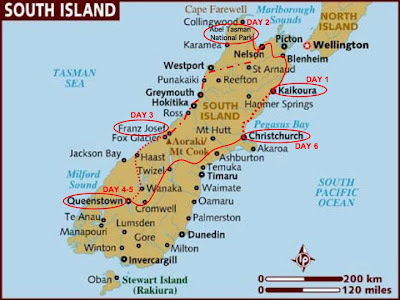 We only have six days to see the South Island of New Zealand, which is a tall order given how much there is to see. We’re planning to make the most of our time by driving around to the top spots that were recommended to us by friends, covering five cities and hours of beautiful NZ landscapes. We started our “Tour de New Zealand” in Kaikoura , a small city known for its abundance of marine life – whales, dolphins and seals – and its strikingly beautiful setting on the sea with a majestic mountain backdrop. We got up early to go whale watching (and luckily got two spots off the waiting list on the second boat out) and despite the seriously rough sea conditions, had a great time learning about and seeing the mighty sperm whale in action. We spotted a male sperm whale 6km off the coast and spent about an hour with him. Sperm whales are the largest living toothed animals and the deepest divers in the sea, diving 1-3 kilometers deep for 40 minutes at a time to feed. In between they spend about 20 minutes at the surface hanging out to catch their breath before diving again. We also learned that the reason for the abundance of marine wildlife in Kaikoura is the underwater geography. The continental shelf isn’t far from the shore, where the seabed drops from approximately 90 meters deep to over 800 meters. The warm and cold water currents converge here, bringing nutrients up from the ocean floor into the “feeding zone” attracting other marine life. After returning to land we walked the Kaikoura Peninsula trail to enjoy the beautiful setting along the water. Pictures of whale watching and Kaikoura are below. Aotearoa, "Land of the Long White Cloud," also known as New Zealand. We arrived this afternoon and plan to spend the last week of our trip exploring the South Island in this little red hatchback we rented. Already getting used to driving on the left side of the street. We're in Kaikoura tonight, hoping to see some whales tomorrow! If there's one thing Sydney does well, it's food. Sydneysiders know how to eat and we've been doing our part enjoying some outstanding meals at a few of Sydney's world-class restaurants. We decided that if London and San Francisco were to have a kid, it would by Sydney. There's a Hyde Park and a Kings Cross, a bay and a bridge. And Sydney definitely combines the charms of London with the natural beauty of SF. We climbed Sydney Harbour Bridge today and were blown away by the stunning views of the city, the harbour, the opera house, and the sunset over the distant mountains. The Bridge Climb is a 3-hour journey to the top of the Sydney Harbour Bridge (the largest and widest single-span steel arch bridge in the world) that took us along the outer arch of the bridge on catwalks and ladders all the way to the "summit." We climbed at twilight, and the city sky at dusk was truly breathtaking. They don't allow you to take your own camera so we had to settle for the three photos they took of us, but we did get to suit up in their specially designed BridgeClimb jumpsuits and get strapped in with a latch and slider attached to a static line to ensure we didn't fall (or decide to jump) off the bridge. The Brooklyn Bridge should start something like this! We arrived in Sydney just in time for the Chinese New Year Parade. It’s a citywide celebration that runs through the heart of the city. And of course, the finale has to include a dragon! It's a little tough to see under all the gear, but that's me in the water. I'm now officially scuba certified so we can dive together anytime! We spent the past two days living aboard a sailboat and diving at the Great Barrier Reef. The Great Barrier Reef is the world's largest coral reef system composed of 2,900 separate reefs that form an outer ribbon parallel to the coast that stretches 2,300km from south of the Tropic of Capricorn to the Torres Strait south of New Guinea, and 80km at its broadest; and it's estimated to be between 600,000 and 18 million years old. They say you could dive here everyday of your life and still not see the entire Great Barrier Reef; we chose to get up close and personal with an outer reef called Thetford Reef, about 20km from the continental shelf where the ocean dips down from around 30 meters deep to 2,000-3,000 meters. I experienced some problems trying to equalize my ear pressure underwater which made my first few dives a little bit painful, but the spectacular kaleidoscope of colors was a good distraction. We saw dolphins, giant clams, sea cucumbers, a large sea turtle, and many different species of fish and types of coral. Kruti and I were diving separately (I was already certified and she was with an instructor) but on the second morning we had an E.T. moment when we found each other underwater, grasped hands and made alien-like sounds of contentment through our regulators. Just arrived in Cairns, Australia, home to the clear blue waters of the Great Barrier Reef (which we could see from the airplane window!). The commencement of the last segment of our trip (Australia and New Zealand)...the beginning of the end as it were. After traveling in Africa and Asia, Cairns looks/feels like we’ve arrived at a country club – green grass, wide streets, and generally vast space. A friend mentioned that Australia would be a good place to transition back to the U.S. Based on the strip malls in Cairns, we think she was probably right. February 14th marked the Lunar New Year (also Chinese New Year) known as Tet, which is the most important holiday in Vietnam and across much of Asia. One of my favorite images from the weeks leading up to the New Year was the ubiquitous mandarin orange tree, which symbolizes “fruitfulness” for the coming year. Take a look at the pictures of Saigon and Hanoi all “dressed up” for Lunar New Year! We did a day trek outside Luang Prabang today, and though the trekking itself wasn’t as scenic or as challenging as we would have liked, we were able to visit some local villages of ethic minorities, including the Khmu and Hmong people. In other countries we’ve visited, visits to villages have sometimes been less than authentic, set up with traditional clothing, songs and dances, and souvenir stalls to sell wares to tourists. These villages, however, felt like the “real deal” with the villagers going about their daily lives during our visit. The village children were shy but curious about the strange-looking visitors and loved seeing their pictures on our digital camera. We could have taken photos of the adorable children all day, but tried to restrain ourselves. Take a look below. Also, check out the amazing photos from a gallery we came across in Luang Prabang named Big Tree Gallery. Some of their portraits and photos of village life were just captivating so we had to share. Laos, once known as Lan Xang or “Land of a Million Elephants” is now home to about 1600 of these endangered animals. We signed up for a one-day Mahout course with Elephant Village, an organization dedicated to saving logging elephants through tourism. A mahout is an elephant handler, so we learned how to guide our elephants through verbal commands while riding on their backs. My elephant, Mae Kham, was about 40 years old (but didn’t look a day over 30 to me) with amazingly coarse hair and leathery skin, and a lovely temperament. It's rare to be able to interact so closely with such massive and powerful animals so Vipin and I both felt like this was an incredible experience. The highlights of the day were learning to climb up onto the elephant on our own (with the help of its leg) and bathing the elephants in the river. Take a look at how much fun we’re having with our elephants in the pictures below! We woke up at 6am today to witness the ritual of the giving of alms to Buddhist monks in Luang Prabang. Around sunrise each day, the hundreds of monks line up with their alms bowls along the main streets of LP to receive food alms from the townspeople. They only eat the food (primarily sticky rice) they receive during this ceremony and from their families each morning and only drink water after midday. For Buddhists, almsgiving is an important element of their religious practice and is a way of honoring their ancestors, but unfortunately this sacred ritual has become somewhat of a tourist circus these days. We saw signs at some of the restaurants in town which read “Please respect our sacred customs” with pictures of tourists getting up close to the monks, even blocking their paths to get the perfect photo. Though we kept our distance to try to be respectful, obviously others hadn’t read the same signs. It was a very sad sight and a reminder of how tourism can ruin something that was once beautiful and sacred. Dinner at Tamarind could possibly have been the best meal I’ve had on the trip. The flavors (particularly the meats) were completely distinctive from anything else I’ve tasted – sharp and aromatic. And the ambiance and service were outstanding to boot. We tried the sampling platter of jaew bong (a thick spicy sweet sauce made from roasted chillies, tamarind and water buffalo skin), roasted eggplant, sweet tomato and peppered cilantro dipping sauces eaten with khai paen (pressed river weed fried with sesame seeds) and Lao sticky rice (the stickiest variety); Luang Prabang sausage, dried spiced water buffalo meat (a delicacy), and meuyang – DIY parcels of noodles, herbs, pastes and vegetables; and chicken stuffed lemongrass. Yes, we overindulged, but the entire meal only cost US$15, and it was delicious! After our experience with the cold/rain/fog in China, we decided to follow good weather to Laos this week. Though I really wanted to go trekking along the rice paddies in Sapa in northern Vietnam, the weather at this time of year is not great, similar to Guilin (not surprisingly since it is close to the border of China). So based on the recommendations of a few friends and fellow travelers we’ve met along the way, we decided to check out Luang Prabang in Laos. What a great decision! Luang Prabang is a beautiful, quaint town at the intersection of the Mekong and Nam Khan Rivers, surrounded by mountains. It feels other-worldly with gold-roofed temples (Wats) all throughout the town and hundreds of monks and novices walking the streets in their saffron-colored robes. Old French architecture (formerly part of French Indochina), little cafes along the sidewalks and streets filled with bicycles, scooters and tuk-tuks add to the charm of Luang Prabang. We splurged on a room overlooking the river and decided to be indulgent and relax here for the week. Massages everyday, great meals, running along the river, sleeping in – heavenly! This was the perfect spot to recharge our batteries. After the family left us yesterday Kruti and I were trying to decide how to spend the next week. Late last night we decided to go to Laos so this morning we taxied to the Lao Airlines office, paid for two tickets in cash, purchased a Lonely Planet guidebook, flew this afternoon, and here we are. I love this aspect of our trip...free to go anywhere we choose at any time. We were looking for an interesting place to chill for a bit and Luang Prabang is it. We like this place. I think we’re going to stay a while. Today is Super Bowl Sunday and I’m bummed not to be in the U.S. for it. The game is not on TV in Vietnam and I was too lazy to hunt for a sports bar at 6am so I’m settling for hourly updates on CNN. I’ve actually been missing the States more this past month than previously and I think it’s all related to the NFL Playoffs. Our trip coincided almost perfectly with the season – we left on September 7 a few days before regular season started and now the season is over and we return in a few weeks. It’s weird...I’m not sure whether I feel like I missed something or nothing at all...definitely saved a large amount of time that would have been spent talking football and watching it on TV. Regardless, Kruti and I were talking about it this morning and we’re getting ready (if not excited) to come home (wherever that may be). It’s been an adventure...we’ve explored many new places and met loads of fascinating people doing remarkable things. Most importantly, we’ve been fully engaged in most of our moments over the past five months. Time to get energized for the last few weeks. Go Saints! Hanoi is full of images we associate with Vietnam: iconic conical hats, locals sitting on low plastic stools on the sidewalk eating bowls of soup or drinking beer, full families on scooters, and masses of motorbikes looking like swarms of bees in the streets, but we didn’t see or feel the “Parisian charm” that we’ve heard and read so much about this city. Instead, Hanoi feels much like any other lively and busy Asian capital to us. We explored the city by foot on our first day, walking around picturesque Hoan Kiem Lake at the center of town and the Temple of Literature, a Confucian temple which was the site of the first university in Vietnam. In the evening we made time to drink some bia hoi (local beer) on the sidewalk, though it tasted so bad we had to resort to playing drinking games to finish off our cups, before checking out the night market for some souvenirs. And on our final day we squeezed in a visit to Ho Chi Minh’s mausoleum to see the well-preserved body of the leader of Vietnam’s communist movement. In between, we took an overnight trip to Halong Bay where we did some kayaking, a bit of hiking and (some of the gang) even braved the cold water for a swim. Though the weather was overcast, the limestone karst peaks still looked amazing. The mountain structures were similar to the landscapes we saw in Guilin and Yangshuo in China, but in Halong Bay, they were island-mountains sticking straight up out of the water which looked even more stunning. Definitely one of our favorite parts of Vietnam so far. Mirror mirror: who is fairest of all? I was struck and a bit confused by what some of the women vendors selling souvenirs outside Angkor Wat were wearing. In the 90 degree (F) heat, these women were dressed in long-sleeve shirts (sometimes double-layered), long pants, gloves, scarves and hats. Sweating profusely in my tank top and Capri pants, I asked one of the women if she was all bundled up because she was cold. She laughed and replied, “want to be white-white,” meaning she was covering up to prevent any of her skin from getting tanned by the scorching sun. I was shocked for a moment, especially since the heat seemed unbearable in that much clothing, but then just saddened by the consistency with which (non-European) cultures equate fair skin with beauty. In India, Fair & Lovely cream launched in the 1970s and is old news, with newer, up-market brands like Garnier introducing skin lightening products targeting both men and women with TV ads that promise to “lighten your skin by two shades.” Here are some advertisements from different brands across Asia. Unfortunately, social hierarchy and economic class in many countries across Africa and Asia have historically been divided by color lines. Whether because of the white colonial history of these countries or because of the difference in color of the wealthy and the working class (who spent countless hours toiling outdoors under the sun) its sad that what I consider an antiquated beauty idea still holds such importance across cultures today. The Elephant Walk in Boston/Cambridge was my favorite restaurant for several years during college (we used to save it for special occasions). 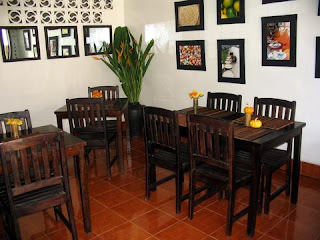 They serve Cambodian and French cuisine (separate, not fused) but I never tried the French because the first time I went I ordered Cambodian and the food was so flavorful I never turned to the French menu. Needless to say I was excited to taste Cambodian cuisine in Cambodia. And it was outstanding. A true gastronomic extravaganza. Kaffir lime, lemongrass, turmeric, ginger and coconut combinations created the most flavorful food we’ve experienced on the trip. 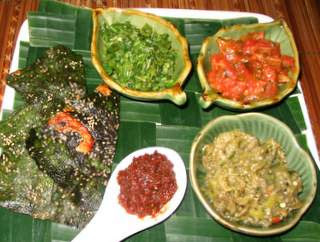 Even the touristy food stalls around the temples served exceptional Khmer curries. Collectively our favorite dish was amok, fish spiced with kroeung and covered with coconut milk then wrapped in banana leaves and steamed. Absolutely delicious. We visited the floating villages of Tonle Sap, just outside Siem Reap. It was quite a sight with homes, schools and businesses all floating on the water. School had just let out for the day so we got some great photos of the kids paddling home! My first trip to Cambodia was in 2001 with my sister, Priti, and 15 of her closest friends from Kellogg Business School. I remember being awed by Angkor Wat – its scale, history, symbolism and idyllic setting – so I was excited to see it again with Vipin. Perhaps not surprisingly given my expectations, I was a little bit disappointed, at least initially. The big differences that had an impact on my experience were the sheer number of tourists and the changes made at Angkor Wat to accommodate them. My favorite memory of my last trip was of climbing up the narrow stone steps to the top of the highest tower and enjoying the serene beauty of the temple and its surroundings. Unfortunately, now the stone steps are covered by a wooden staircase and wooden railings/walkways have been built throughout the tower for tourist safety, making it so much harder to imagine how Angkor Wat felt as a place of worship hundreds of years ago. And of course the scaffolding over parts of the temple and wall carvings for restoration is always an eyesore (though necessary, I understand). Luckily we returned to Angkor Wat on our last day to watch the sunrise over the temple and walk around without droves of tourists around – I was inspired all over again. The part of Angkor Wat that I was amazed by initially and that hasn’t changed at all is the enormous wall carvings depicting scenes from the Ramayana and Mahabharata, two great Hindu epics. Though I’ve seen many beautiful carvings at temples in India and the US, it was incredible to see the influence of Hinduism in this part of the world. Angkor Wat was initially designed by King Suryavarman II and dedicated to Vishnu, though the temple was later converted to a Buddhist temple. More on the history of Angkor Wat here and here. Beyond the temple, the town of Siem Reap has changed considerably. In 2001 Siem Reap still felt relatively unmarred by tourism. Cambodia only reemerged as a major tourist destination again at the end of the 1990s, after the devastating genocide under the Khmer Rouge and the Civil War that followed ended. Though this period in Cambodia’s history was bleak, the country is now a highlight in the Southeast Asia travel circuit and has benefited greatly from the influx of tourism-related revenues. The downside is that Siem Reap is now full of hotels and souvenir stalls, taking away from the charm of the town. We only spent three days in Siem Reap, but were able to visit several ancient temple complexes. None of the other temples attract as many tourists as Angkor Wat, so you still feel a bit like an explorer climbing around the ruins. Our three favorite temples were Bayon, Banteay Srei and Beng Mealea. Bayon has a distinctive design with 216 gigantic faces across 54 towers so you can see a face from any angle (and they can see you). It looked particularly cool in the early morning sun. Bantey Srei, is referred to as the “jewel of Khmer art” because of its intricate carvings and was particularly interesting because it was dedicated to Shiva (unlike most of the temples which were dedicated to Vishnu). The name of the temple means “citadel of women,” probably because the carvings are so fine they could only have been carved by the hands of women. Beng Malea is about 40km from Angkor Wat and you have to travel some rough roads to reach there, but it's totally worth the effort. The temple has been “embraced” by the jungle and is largely unrestored, so you can climb over the enormous stone piles and through rooms overrun by tree roots. An amazing place I would definitely recommend to anyone! Our friends living abroad have shaped our travel experiences, particularly in large cities, by giving us more insight into local culture than we could ever get on our own and by sharing recommendations of their favorite neighborhoods, sights and restaurants. In Vietnam, we met up with our friend Henry, who was a section-mate and friend of my sister from business school. After graduating from business school, he moved to Vietnam to start a telecom business, launched and invested in several businesses since, and is now managing a venture capital fund in Vietnam. Despite the fact that we almost made him miss his flight to Hanoi the day we arrived in Saigon and that we are traveling in a group of six currently, Henry has been an amazing host (check out the pic of him on a moto-taxi rushing to the airport!). He drove us all around Saigon, took us to a home-style Vietnamese restaurant, showed us an evening of unforgettable drunken karaoke, invited us to his company lunar new year party, took us to his amazing restaurant Vine and patiently answered our never-ending questions about culture, politics and business. It was particularly interesting to hear Henry’s perspective on investing in Vietnam. The country’s 10-year average GDP growth rate is estimated at 7-8%, but because of its size (86 million population) it is never mentioned in the same breath as India and China. Henry sees Vietnam as exactly where Japan and China were 30 years ago, and hence his investment strategy is based in part on case studies of successful businesses in those regions. Given the growing middle class with increasing disposable income his most active investment areas are consumer, media and online businesses, and since we've both spent a little time in these sectors we had a great time chatting about his investments. We thought some of the most exciting businesses in his portfolio are YAN music television network; Xalo, an online search business modeled after Baidu; Vinabook, an online retailer similar to Amazon.com; and VinaGame, a leading Asian gaming business. Can't wait to see him again when we return to Saigon! We left winter in China for heat and humidity in Vietnam. Feels good to be “on vacation” again. My brother Jay and sister-in-law Tonia joined us from Seattle for the second time on the trip (they’re both working on negative vacation days this year), and our cousins Pooja and Tina from Chicago joined us as well for ten days in Vietnam and Cambodia. It’s been a treat to meet up with our siblings, friends and extended family in far-flung places! We arrived in Ho Chi Minh City (also known as Saigon) and at the airport learned that the Vietnamese currency is called the dong and the exchange rate is US$1 = ~18,500d. We wanted to withdraw around $100 and calculated that should equal approximately 2,000,000 dong, but as I typed in the zeroes I became nervous that we had miscalculated and added an extra zero or two and that we would have $10,000 in dong instead of $100. Could that be right? 2,000,000 dong? Talk about hyperinflation. I canceled the transaction, recalculated a few times, and finally withdrew two million dong. Here’s comedian Russell Peters on the Vietnamese dong. Food in Vietnam has been a highlight. My favorites have been the spicy vermicelli with grilled pork & fried spring rolls (Bun Thit Nuong Cha Gio) at Quan An Ngon and the sweet, condensed milk-laden Vietnamese ice coffee ca phe sua da at Café Givral (Kruti and I were planning to share one but it was so good that I slurped it all up before she could even try it and we had to order another one). Definitely going back for more. The two sights we visited in Saigon were both related to the Vietnam War; it was fascinating to learn about the war from the other perspective. The War Remnants Museum, documents the atrocities of the war and displays brutal photographs of some of the war victims – those who suffered torture as well as those who were born with birth defects caused by the use of defoliants (Agent Orange). Sure it’s a bit propagandist in tone but it’s stuff I didn’t read much about in U.S. history books, what exactly is true I have to do more research on. The Cu Chi tunnels were even more instructive. The people of Cu Chi (a small village 30km from Saigon) began digging the network of tunnels in the 1940s, during the French occupation; during the Vietnam War it became a Viet Cong stronghold, and by 1965 they had burrowed more than 200km of tunnels. During raids or when Americans were nearby, everyone would scramble belowground through concealed entrances, while above, enemy soldiers would find themselves in a suddenly abandoned jungle. The ones that did discover the tunnels almost certainly died either because they couldn’t find their way out or at the hands of the Cu Chi warriors hiding underground. The tunnels are extremely claustrophobic (some only 30 inches wide) and it’s amazing how anyone could endure living in those tunnels sometimes for days waiting for an all-clear signal. The most enlightening facet of our visit was learning about the ingenuity of the farmers and peasants of Cu Chi – they designed and laid painful-looking homemade booby traps fashioned from bamboo and the recycled iron of U.S. artillery pieces, they made shoes from the used tires of U.S. army vehicles and shaped the heels larger than the toes so that their footprints made it look like they were going in the opposite direction than they actually were, and many other tactics. The people of Cu Chi were scrappy. Startup scrappy. It began to make more sense how the Viet Cong guerillas were able to match up to the U.S. armed forces and defense budget. Upon returning to Hong Kong the contrast to mainland China was especially striking. The first thing I noticed was how English-friendly Hong Kong is, from the signs at the train station to the street names, which shouldn’t be surprising given HK’s British colonial past. Aside from language, there are significant differences economically (different currency) and politically (open internet), which China refers to as "one country, two systems" because of the terms of the 1997 handover of Hong Kong by Britain. 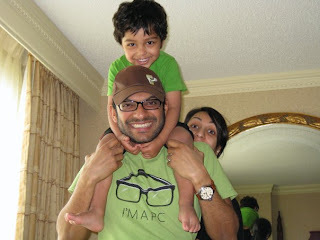 On this visit we were fortunate to stay with our friends from business school, Nirav and Juhi. It was so wonderful to catch up with them, have home cooked food again, and watch some good old American Idol on TV. And we had the greatest time playing with their adorable children Rohit and Jaya who reminded me a ton of my own nephew and niece. A few people have asked about my food experience traveling as a vegetarian. After visiting China, which is a notoriously difficult travel destination for vegetarians, I thought it was time to address this question. Though I’ve always been able to find something to eat everywhere we’ve traveled so far, it has been admittedly difficult to explore the culture of some of these places through the food because so many of the cuisines are so meat-centric. So what I found is that the more tourist-oriented places like hostels and guesthouses have been where I’ve had some of my best meals (since they’re accustomed to the vegetarian backpacker crowd), though they often certainly lack much of the authenticity of local cuisine you’d find elsewhere. In China we were lucky to stay with friends who spoke Mandarin and could take the guesswork out of ordering food so it wasn’t until we reached Chengdu that we faced the challenges and pitfalls of finding food on our own. For our first meal there, we ordered a tofu dish after confirming it had no meat (with the help of a few phrases our friends armed us with) but upon examination, found ground pork or beef in it. Then there was the amazing dumpling place Vipin discovered where we unsuccessfully tried to order off-menu vegetable dumplings. One notable exception in China was going out for street food in Xian’s Muslim Quarter where Ravi was with us and helped me navigate the options. I had these amazing fried sandwiches with greens and eggs inside as well as some tasty mini-pancakes made of rice flower with red bean jelly and crushed peanuts on top. Emboldened by this experience, we had some street food again in Lijiang where we tried a sandwich with spicy noodles and greens in something like a pita pocket and another sandwich on traditional fried Naxi bread with fried eggs, tomato and goat cheese inside. The food we had at the guesthouses along our hike at Tiger Leaping Gorge was outstanding as well. Since they’re used to vegetarian travelers they all had extensive veggie options on their menus. - In the Middle East and North Africa I found a world of delicious vegetarian salads and dips beyond hummus and baba ganoush but main dishes almost always featured meat. - In Morocco I could usually find a vegetarian tagine or couscous but the quality fluctuated wildly across restaurants. - In East Africa I was surprised by how often we found Indian-inspired vegetarian dishes everywhere we went, including at safari lodges, probably because of the large Indian population there. Luckily, I could almost always find some pizza whenever I needed a little bit of comfort food and an escape from the food jungle while traveling. We were reflecting recently on what a tremendous effect the weather has had on our enjoyment in the places we’ve visited so far. It may seem obvious but it really hit home for us when we reached Guilin a few nights ago in the pouring rain. Similarly to Beijing, the cold weather made us want to curl up inside, but even worse it was rainy and foggy for the few days we were there, making it difficult to appreciate the dramatic landscapes Guilin and Yangshuo are known for. First, we took a day trip to the Dragon’s Backbone Rice Terraces (also one of the top trekking destinations in China according to Lonely Planet) where we enjoyed hiking but couldn’t see much because everything was shrouded in fog. The next day we headed to Yanghsuo where the landscapes are dominated by amazing karst peaks formed by enormous caves whose tops have collapsed leaving the massive sides standing looking like unnaturally tall, skinny mountains. We really enjoyed seeing the cool landscapes of Yangshuo though they were tough to capture in photos; we went cycling through some of the villages nearby to get a better look at the countryside. It was definitely an adventure trying to navigate our way on the unmarked path, asking directions of villagers who spoke no English, getting lost on a farm, riding along narrow, muddy paths and getting a flat tire all before heading back to Guilin to catch an overnight train back to Hong Kong! Hiking the Tiger Leaping Gorge was one of the highlights of our time in China. It's one of the deepest gorges in the world, measuring 16km long and 3,900m deep from the Yangtze River below to the snow-capped mountain peaks to the east and west. Prior to getting started Kruti was a little bit nervous because we had read that a handful of foreign travelers had died trekking in the gorge, but once on the trail it actually felt completely safe to us. We left Lijiang for two days, hiked 5-6 hours a day, spent the night at a friendly little guesthouse on the trail, and even got to attend a Naxi wedding celebration along the way. The photos attempt to do justice to some of the most dramatic and memorable landscapes we've experienced. Coming from a family of three sisters and no brothers, I’m always excited to find cultures in which a strong respect for women is core to the social fabric since we’re so often reminded that we live in “a man’s world.” The Naxi people are an ethnic minority in China originating from Tibet and based in Lijiang for the past 1,400 years, who traditionally have a matriarchal family structure. Women are the heads of family and the primary breadwinners, inheritance of property is matrilineal, and disputes are adjudicated by female elders in the community. One of my favorite tidbits from our guidebook about how the Naxi language reflects the culture -- the words for female and male are used to modify nouns to show more or less importance, so a “female stone” signifies a boulder and a “male store” represents the idea of a pebble. Though the culture has changed over time, the traditional culture is still evident in everyday life. Guesthouses are run primarily by Naxi women while their husbands serve in support roles, waitresses at restaurants address the women at a table first, and the majority of taxi drivers we saw were female. What a refreshing change after seeing the challenges that women face in other cultures around the world. We traveled to the southwest province of Yunnan on Andrew's recommendation. It's his favorite place in China and it quickly became ours as well. We fell in love with Lijiang's old town, the cobblestone streets, wooden houses, tiny alleys, and easy-flowing canals. The climate was ideal with clean skies and springlike temperatures in January, a pleasant change from the smog and cold we experienced in Xi'an and Chengdu. Time seemed to slow to a standstill for a few days. Besides being famous for spicy Sichuan food, Chengdu is also known for its panda bear population so I was excited to visit to the Giant Panda Breeding Research Base, home to almost 50 giant and red pandas (of only 1,000 pandas in the world). The research base is one of eleven panda reserves in the country dedicated to the survival and breeding of the panda population. We even paid a hefty sum so that I could actually hug a panda (in a protective gown and face mask of course, given the H1N1 flu season), which felt like a giant, cuddly teddy bear! Chengdu wasn't on our initial itinerary but the flights from Xi'an to Lijiang on ctrip.com (China’s version of kayak.com) were cheapest via the capital of Sichuan so we decided to stop there for a day to taste some spicy Sichuan food in the province itself and visit the giant pandas. My taste buds were thanking us. Sichuan peppercorn is the predominant flavor in Sichuanese cuisine; it has a tingly, numbing effect (in contrast with chili pepper spice) that remains with you long after eating. The night we arrived I went straight to the nearest little snack shop for some fiery Sichuan dumplings – hot and spicy and mouth-numbingly delightful. And you can't go wrong for US$0.60! They were so good I went back for another bowl before our flight the next evening. We persuaded Ravi to fly from Shanghai and meet us in Xi’an for the weekend, which gave us a couple more days of quality time with him and extended our ability to get by in China without having to put our limited Mandarin vocabulary to use. Xi'an was an ancient Chinese capital at the end of the Silk Road. Today people go to Xi’an to see the Army of Terracotta Warriors, one of the most famous archeological finds in the world. It’s a life-size army of thousands of terracotta soldiers and horses in battle formation that was created to “guard” the tomb of the emperor who first unified China, Qin Shi Huang, more than 2,000 years ago. The Army was discovered in 1974 when peasants drilling a well uncovered one of the underground vaults. No two soldiers’ faces are alike and the level of detail is extraordinary, but frankly we were a little bit disappointed by the Terracotta Army. Most of the warriors are still buried and there are signs showing where they are located underground, but it felt like we were looking at three large excavation sites prior to 80% of the excavation. And you can't get that close to the soldiers that have been dug up. Anyway, we stared at the motionless ranks of warriors for a couple hours and went on our way. That evening we hit the Muslim Quarter for some fine dining. The backstreets were colorful and lively and the narrow lanes full of sweet-smelling stalls. We must have tried every type of Islamic food in the market…chili-rubbed mutton kebabs, fried beef in pita break with green peppers and cumin, peanut cakes on a stick…absolutely delicious! The next day we took a day trip to climb Hua Shan, one of Taoism’s five sacred mountains. Granite domes, narrow ridges, and sheer cliffs. Ascending the mountain took us above the gray smog in Xi’an and allowed us to soak up some sun (you can see the gray smog-line stretching across the horizon in some of our photos). After the climb we had to race back to Xi’an and got to the airport just in time to check in for our next flight. Seven sections of the Great Wall are profiled in Lonely Planet and more than 55 million foreign tourists visit China annually. So what are the chances of running into my friend and classmate from business school, Shailendra, on the Great Wall?! We had met up with him and his wife in Mumbai and knew he would be in Beijing for some meetings but hadn’t connected since we reached China. As we were laughing about the coincidence and catching up, he received a call unexpectedly from another classmate, Dylan, who lives in L.A.! We convinced Andrew to ditch work Friday and join us for an epic hike on the Great Wall of China. There are several sections of the wall that can be visited, each with its own unique advantages. We chose to go to a section called Mutianyu which is relatively close to Beijing and where the wall has largely been restored, but because we’re here during low travel season (and because of the cold) there were very few other visitors so it felt like we had the whole place to ourselves for most of the day. We were also incredibly lucky with the weather – we had a bright, sunny, wind-free day – so instead of a quick half-hour on the wall as we expected, we spent six hours hiking, and made it out past the restored sections of the wall where we saw it in its original, crumbling state, covered with snow and with trees growing out of the cracks. The views were incredible and the hike was one of the highlights of our trip to date. One of the best aspects of our trip has been the opportunity to reconnect with friends we haven’t seen in many years. The week before we arrived in China I discovered that one of my friends from high school, Andrew, now lives in Beijing. We traded a bunch of email and he invited Kruti and me to crash with him and we did. Andrew and I had only seen each other once since high school at our ten-year reunion more than five years ago and had pretty much lost touch outside of the occasional Facebook stalking, so we were getting to know each other all over again. What an awesome guy. Dynamic, extremely generous, spirited, thought-provoking, and very warm. He’s a scholar of East Asian Studies, fluent in Mandarin, and working in investment management in Beijing. And he’s the consummate host. The three of us stayed up late catching up and telling stories every night and poor Andrew had to go to work in the morning while Kruti and I slept in; when we woke up maps were laid out, itineraries drawn up, and snacks left on the table to get us through the cold winter days walking around Beijing. Kruti and I are big fans of Andrew and I’m really happy this trip got us back in touch. Another good friend from high school, Bob, the one who put me back in touch with Andrew, was in town from NYC for a conference that week and it was great to see his familiar mug on the other side of the world as well. We all went out to dinner a couple evenings and even caught a Chinese acrobatics performance. It was a fantastic reunion. Other than catching up with friends, we attempted to see Beijing’s sights but the cold weather made it difficult to enjoy. We spent the first day exploring the imperial grandeur of the Forbidden City (so called because it was off limits for 500 years, home to two dynasties of emperors) and Tiananmen Square (the world’s largest public square) until our toes almost froze off. The second day we wandered around the 798 Art District (disused, sprawling electronics factory workshops converted into galleries) admiring the latest in Chinese art. And the third day we journeyed into the hutong, the city’s warren of ancient, narrow alleyways and one-storey dwellings that were part of the original heart and fabric of Beijing. Check out the photos. Welcome to Beijing and winter! We’ve been following summer around the globe but the ride came to an abrupt end once we reached China. Winter slapped us in the face and our toes almost froze off as we attempted to explore the Forbidden City and Tiananmen Square. The reinforcements we purchased in Shanghai (hats, scarves, gloves, boots) were no match for the bitter, biting cold here. Apparently it’s the coldest winter in Beijing in the last 35+ years (perhaps the unanticipated result of the Chinese government’s weather manipulation). We only lasted for about two hours walking around the Forbidden City, which felt like a giant wind tunnel, before being forced to take refuge indoors to warm up for an hour, then we braved the cold again to see Tiananmen Square by night. The intense security around the square and sheer number of police (both in uniform and plain-clothes) was on a scale I’ve never seen before. Obviously the Square is an incredibly important and symbolic place for the Chinese – it was where Chairman Mao proclaimed the People’s Republic in 1949 as well as the site of the tragic pro-democracy demonstrations of 1989. The cold was so intense we actually discussed hightailing it out of China earlier than planned to go somewhere warm like Bali! But in the end, we decided to persevere and just keep buying warmer hats along the way (first hat purchased in India in anticipation of cold weather in China, second in Shanghai, third in Beijing, fourth at the Great Wall). But the bright (and warm) spot of our time in Beijing has been staying with Vipin’s friend, Andrew, who took great care of us and was a wonderful host. We began our Chinese odyssey in Shanghai. It's a massive, vibrant city, and we loved it. One thing is certain – Shanghai looks much more developed than any city in India, particularly with respect to roads, buildings, and infrastructure in general. It actually looks more similar to the U.S. or Europe than India. Prior to visiting I had the perception that Shanghai would be an ultramodern concrete jungle based on what I had heard but actually we were pleasantly surprised by how charming the neighborhoods in western Shanghai are, particularly the French Concession area. It's a little piece of Europe in China. We went to Shanghai mostly to hang out with my college roommate Ravi, who's been living there for the past three years and working for Frog Design. He has a lovely home and a fantastic group of friends. We spent five days in Shanghai and Ravi did what he does best – he showed us the pulse of the city after dusk. Ravi and his friends took us to some of the best of Shanghai's restaurants, bars and clubs. We know several people who haven't enjoyed food in China but we ate extremely well. Taiwanese noodles at Noodle Bull, Japanese Yakitori, Shanghainese dumplings at Din Tai Fung, and the best of Shanghainese cuisine at Jesse. We also partied at a "Chinese" club called No. 88 drinking bottles of Chivas Regal mixed with green tea (quite tasty actually) one night, and listened to Ravi's friend Nat spin at a live music venue called Shelter the next night. The other thing we did in Shanghai was shop. We were shocked at just how conspicuous the markets that sell fake knockoffs and pirated goods are. You hear about China taking a stronger stand against piracy...doesn't look like it. A four-floor mall selling fake branded bags, shoes, clothing and Rolexes and a DVD store sprawling with pirated movies and TV show box sets right on the main shopping streets in the center of town. Unbelievable. But yes, good deals. Ravi also introduced us to his tailor, Tony the Tailor, a Sindhi guy from India who worked in Hong Kong for more than 20 years before moving to Shanghai five years ago because that's where the action in Asia is these days. Entrepreneurial. I got two suits made and Kruti got a cashmere coat. Apparently Tony's father tailored suits for former President Reagan, and Tony himself was summoned to measure President Obama when he was in Shanghai a couple months ago. Bizarre that Obama would get suits made by an Indian guy in China, and that this type of news wouldn't lead to more bad press, but who knows, Tony has the photos to prove it, and we decided we can't go wrong with that company. We had a fantastic time in Shanghai and even think it's a place we could live someday (once we learn Mandarin, and find some interesting work to do). Ravi was the perfect host and we can't wait to come back and visit him again. Get email updates from TwoNomads!